Home » Accounting Dictionary » What is a Market Failure? Definition: Market failure indicates inefficient allocation of goods and services in an economy. This can be the result of several reasons, including a monopolistic structure and negative externalities. 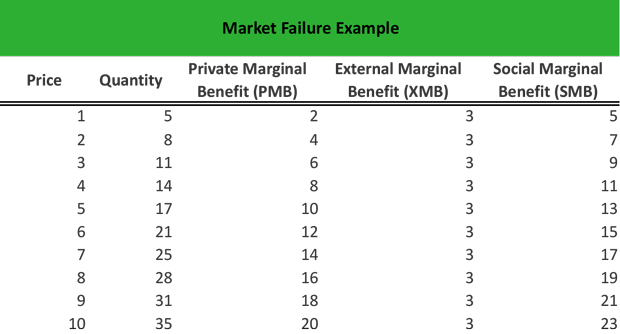 What Does Market Failure Mean? What is the definition of market failure? Market failures are the situations where personal benefit drives the decision-making, leading to wrong decisions for the society. Put simply the quantity demanded and the quantity supplied are not in equilibrium, thereby creating a shortage or surplus. In this context, important factors in market failures are the externalities, i.e. the decisions of a group, which affect the decisions of third parties, the social benefit, the social cost, and the social efficiency. When the market is a monopoly, a sole producer or a group of producers who control the market can decide on the price of the good they produce (price setters). Monopoly privileges may lead to market failures if the goods produced are not consumed by consumers due to high prices or because they do fail to meet consumer expectations. The number one factor is externalities – in this case, what the monopoly does to affect the third parties, i.e. society. Third, the social cost incurred, which should be equal to the private marginal cost (PMC) and the external marginal cost (XMC). Finally, the social marginal cost (SMC) should be equal to the social marginal benefit (SMB) to ensure social efficiency. In the absence of one or all of the above factors, a failure occurs, violating the assumptions of social welfare and causing the market to deliver an output that does not maximize efficiency. Define Market Failures: Market Failure means the economy did not meet the needs of consumers or benefit society in highest degree. 1 What Does Market Failure Mean?